I haven't seen the new Brideshead because I was a huge fan of the original. I even read the book because I couldn't wait each week to find out what happened. I was also lucky enough to have Diana Quick who played Julia as an acting teacher when I studied in London. I was glad to see that they kept Castle Howard as the location but bummed that they didn't really use it. I'm wondering if it was because the budget was really low. I remember reading an article in Vanity Fair about the house and how the woman who is married to the owner always wanted to live there, and was determined to marry the owner and she did. I've yet to see the film because I adored the miniseries Elizabeth refers to. To me, it's the "touchstone Brideshead", although I have to confess that I never read the novel! 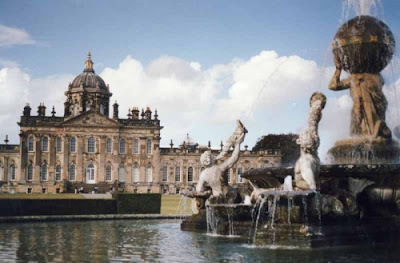 I've always wanted to visit Castle Howard, so thank you, Kathrynn, for the sneak peek! Hi Elizabeth, the Castle Howard official website has the whole story about the woman who married the man who inherited the castle. He (they) were determined to save and restore it . . . much of it was destroyed by fire (20 rooms) in the 1940s. He said it costs millions yearly to maintain it, and the cost of admissions to the thousands that go on public tours goes a long way to keeping in good repair. I've never read the novel either, Amanda, but I have watched the original PBS series. The author hated his book even though the NYT reviews lists it as as one of the top 10 books ever written! I too loved the earlier version of Brideswhead Revisited. I do want to see the movie, but I have a hard time imagining how a movie could capture all the richness and nuance the series did. I read the book after I saw the series, and the original series is very true to the book--pretty much every scene in the book is in the series, and there's only one scene in the series, as I recall, that isn't in the book. In the series, I thought the house was used wonderfully and really became a character in it's own right. Interestingly, it wasn't until recently that I realized (I can be slow :-), that the title basically means "virginity revisted." Virginigty revisited???? Wow, Tracy I didn't know that either, but I wondered about the origin of the name Brideshead...thanks for the info! Equating "brideshead" with "maidenhead." Which really fits, as Charles is revisiting his moral and romantic virginity in returning to Brideshead. I agree with you entirely, Kathryn. I was very disappointed in their use of Castle Howard. Why bother, was what I thought. What they showed could have been recreated on a soundstage. Yes, I will go back to the miniseries version and be perfectly happy. Setting IS character, especially in this story. I have read the book and the place is entirely the point. The trailers for the new Brideshead Revisited were imo horrendous. The usually wonderful Emma Thompson looked as though she'd been embalmed and spoke her lines as though from the proverbial crypt. What a revoltin' development. But I've always wanted to see the Masterpiece Theatre version (which I missed) and evidently I'm not alone in this. Adding it to my Netflix queue yesterday, I was informed that I was in for a LONG wait.